The extraordinary Madagascar palm is not a palm at all but a succulent plant armed with needle-sharp spines and a palm-like top. The top of a more mature Madagascar will bloom with pretty white flowers in summer, and often branch out at the point of bloom. Unique and quirky, this succulent plant doesn't require much water or care. 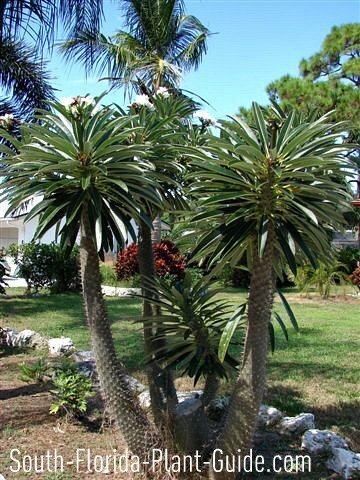 Because its spines are extremely sharp and plentiful on its silvery trunk, the Madagascar should be planted away from foot traffic or areas where kids or pets (or anyone) might accidentally touch it. 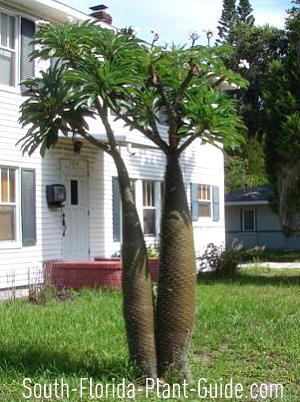 Many Madagascars develop a swollen trunk over time (the botanical name means "thick foot"), adding to the unusual effect of this "palm" in a landscape planting. Madagascar palms can actually get big - 18 to 20 feet - but this takes many years since the plant's growth rate slows with age. In the landscape, you'll rarely see one over 10 feet tall. These are generally moderate growers, though they may take off pretty quickly once they're in the ground. In a container, which is how many people grow them, the rate of growth will be somewhat slower. These plants love full sun and work well in hot, dry spots in the landscape. A Madagascar palm is moderately cold-tolerant, preferring Zone 10, but in warmer areas of Zone 9B you can keep it in a pot to move indoors during cold snaps or plant it in a sheltered spot and cover it during cold nights. Don't be surprised to see some or all of the glossy green leaves fall off in winter...in spring the top will begin to fill out again. Madagascars are moderately salt-tolerant, making them a good choice for coastal landscapes in areas subject to salt spray. Bright white flowers appear in summer, adding to this exotic plant's appeal. No need to add soil amendments when you plant...the Madagascar prefers sandy soil. VERY IMPORTANT: Let the soil dry out between waterings - if the plant is overwatered, it will rot the trunk. 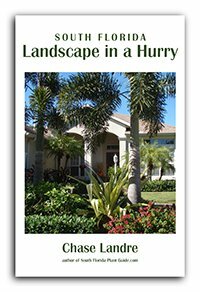 Fertilizing with a controlled-release fertilizer several times a year is plenty for this unusual little "palm." Cold can damage a Madagascar palm, showing up in the form of rot (soft and mushy tissue with a crumpled, withered look) on the ends of the branches. Prune the damaged branch back to just past the point of healthy tissue - or cut off the entire branch if the whole thing is affected. 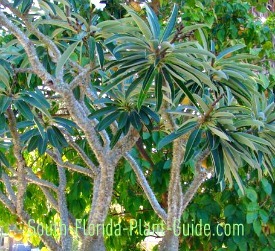 You can plant a grouping of several very close together, or just one as a single-trunk specimen. In group plantings, as with all palms or palm-like plants, trunks will bow out as the plant matures. PLUS after blooming, new heads may form and cause the plant to branch out, so allow enough room for growth and for you to get around it safely. If you're planting near the house, come out several feet to make sure the top doesn't eventually end up in eaves or roof gutters. 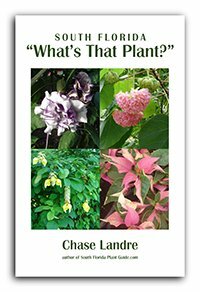 This is a great container plant and conversation piece, like a cactus/palm combination. In all cases, keep the Madagascar away from areas of recreational activity, or drives and walkways where someone could get stabbed by the Madagascar's wicked spines. And beware of planting other things close to the palm that require a lot of maintenance. 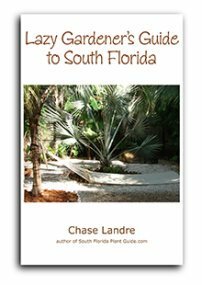 COMPANION PLANT SUGGESTIONS: Other drought-tolerant plants such as crown of thorns, bulbine, Green Island ficus, clusia and agave.